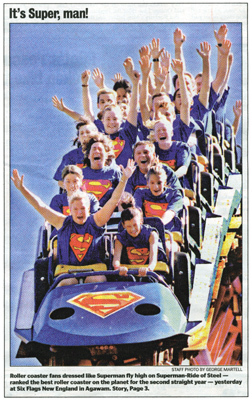 Brave amusement park goers, above, prepare for a plunge on the Superman-Ride of Steel ride yesterday morning (July 16, 2001) at Six Flags New England in Agawam. The thrill ride has been selected as the best roller coaster on the planet for the second consectutive year by Park World Magazine. 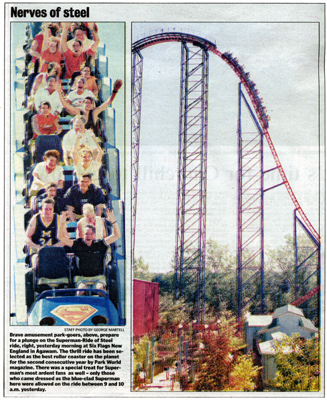 There was a special treat for Superman's most ardent fans as well - those who came dressed as the blue-clad Superman hero were given free admission and had exclusive access to the ride between 9 and 10 a.m. yesterday.